As we all know a little black dress is considered the best staple to have in your wardrobe. Until recently I must admit that the all important LBD was missing from my life; I rarely wear black and I could never find a black dress that wasn’t too plain. When I found this dress from Review, that all changed. I love the pretty white detailing; it provides the potential for a classy look and is extremely versatile. Black and white is always such a lovely combination. I believe this dress could be worn to a wide variety of occassions. This is one of my current favourite outfits and is definitely fast becoming a go to outfit when I have nothing else to wear. 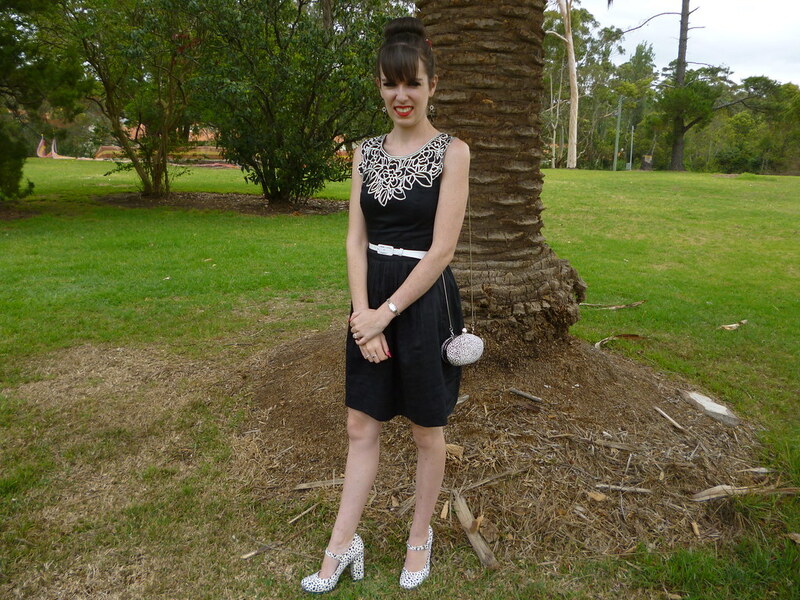 I love it how a black dress is such a blank canvas for accessorising. I finally had the chance to show you how I styled my dalmatian print shoes which I posted here (I bought these for such a bargain price!) I was very excited when I received this little bag for Christmas with almost an identical print. I really adore being this matching. I’m sure you’ve noticed that I’ve had the same hairstyle for a very long time now. I’m trying to decide what to do with my hair and the bun is a simple style I can do every day while thinking; I wouldn’t want to make any spontaneous decisions that I regret. I don’t think I want to cut my hair short again; it took so much effort to keep it straight all the time. But at the same time, my hair is really thin and I hate my natural hair texture so growing it doesn’t really work that well. I can’t have this same hairstyle forever as much as I do love it so I need to work something out. 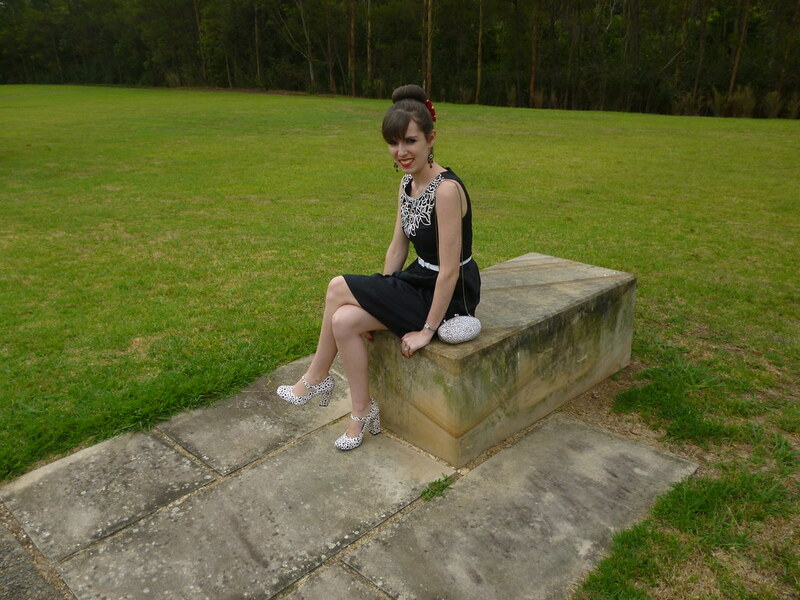 This entry was posted in Alannah Hill, Outfits, Review Australia, Wittner. Bookmark the permalink. 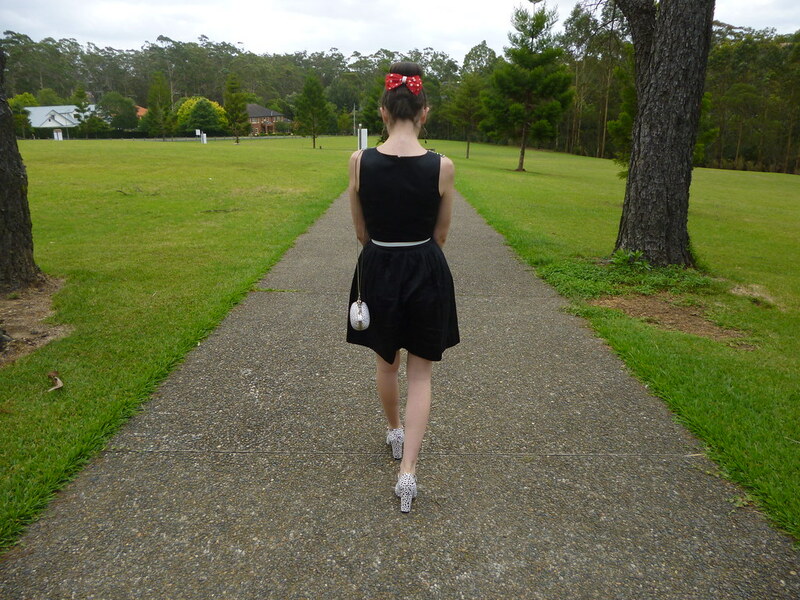 Those shoes are so cute on you Imogen! I haven't been by your blog in a little while and I totally forget how it is Summer over there – it's far too cold and snowy in the UK right now! oh WOW how I love your shoes Tia!!! They are so so so precious and perfect in every way. I love this – your look reminds me of Audrey Hepburn, but with a playful, modern twist. aw this is a really cute look! love the way you mixed up prints with the dalmatian shoes and hair bow! the dress is stunning too, and you can definitely work the hair bun! 🙂 it's very elegant and simple. my bun rarely stays up, and even when it does it looks messy/uptight schoolteacher-ish lol. Metallic Paws– New giveaway up on my blog! i have never seen such a cute pair of shoes! Imgen you look so lovely, and those shoes are gorgeous too. In reply to your last comment on my blog, I hope you're feeling better now and more positive too. Fabulous outfit, i love the shoes, i'm follow you with gfc !! Hello ¡!! Thanks for your visit and your lovely comment, of course we can follow each other, I have a count in facebook, twitter, instagram, bloglovin, pinterest and lookbook, in case you want to keep in touch there too… follow me and I´ll follow you back wherever you want ok! Whoa that dress is amazing! Love the neckline! That is a very pretty LBD! I never know what to do with my hair either- I almost always wear it down, but it would be nice to switch things up a bit! Just found your blog too, yay! I love this outfit! The bow gives it that perfect little touch, and those shoes are amazing! 🙂 You look fantastic! GORGEOUS!!!! I love every detail of you outfit!!! Love this LBD, the pretty detailing on the front is beautiful! I am also loving the heels! Your hair looks amazing styled up in a bun! Gorgeous!! !